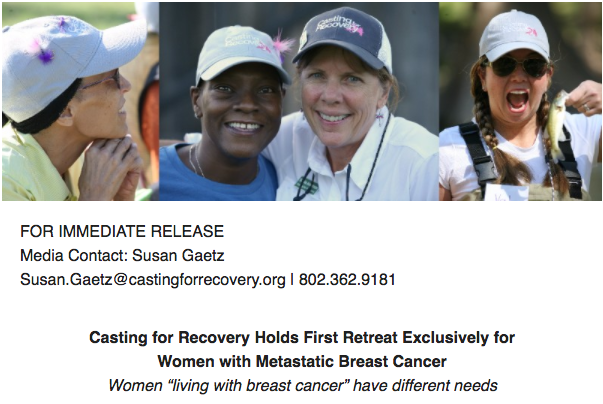 In 2016, Casting for Recovery launched a new retreat program exclusively for women with Stage IV (metastatic) breast cancer. Recognizing that women with advanced stage disease have specific needs, CfR expanded their Stage IV retreats in 2017 to serve more women. In 2019, we will host 4 retreats for women with Stage IV breast cancer in the following states: Colorado, Texas, Indiana and Georgia. Note: Women living in these states who previously attended a CfR retreat may apply again to attend their local Stage IV retreat. If you have Stage IV breast cancer and there is not a Stage IV retreat in your area and if you have not previously attended a CfR retreat, you may apply for a traditional CfR retreat in your area by clicking on your state HERE. Our traditional retreats are open to women of any age, in any stage of breast cancer treatment or recovery. We hope to expand our Stage IV retreats to new areas each year. This retreat is for women living in IN. This retreat is for women living in CO.